I got questions from WordPress users how to change page status from ‘published’ to ‘pending for review’ automatically in case its author changed it. Its possible with little piece of code in your theme functions.php file and the same little user capabilities manipulation. You can look how it works on the video by this link or scrolling to the end of this post. So it seems, that problem is resolved. No. WordPress 2011 theme (and possibly others) is written such way, that page (with all changed content) is shown in any status, including ‘draft’. You just should know its link. Make little experiment. Create new page and save its draft. Then type in the browser URL to this page. Do you see it? Yes, me too. How to change this WordPress behavior? We need to update the ‘page.php’ template file from the 2011 (Twenty Eleven) theme package. User capability “add_users” was added to the WordPress “Administrator” user role since WordPress version 3.0. 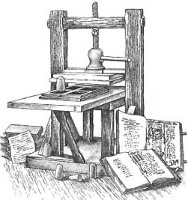 But this capability is not used yet by WordPress itself in any form. Perhaps it was added for use in the future versions and could be use by themes and plugins developers of course. It does nothing in the WordPress 3.3.1. So you may skip it temporally in your WordPress capabilities system research. 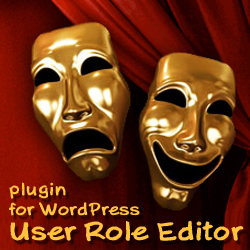 User Role Editor WordPress plugin v. 3.4 is published. What’s new in this version? I got feature request from one user about ability to edit “Administrator” role. Sometimes plugins or themes add its own capabilities to other (may be its own) roles, not to administrator. Thus, you may meet with situation, when some user can do more, than blog admin. That’s not so good. moderate_comments WordPress user capability “allows users to moderate comments from the Comments SubPanel (although a user needs the edit_posts Capability in order to access this)”, – oficial WordPress Codex page says. What I can say? Do not trust your own eyes. It is not the full true. Only last part of this declaration (about “edit_posts” capability) works as described in relation to the Comments subpanel. Are you not sure? Check it yourself. Take “User Role Editor” WordPress plugin, select the “Editor” role and uncheck “moderate_comments” capability. Then login to WordPress under the user with “Editor” role and go to the “Comments” panel. 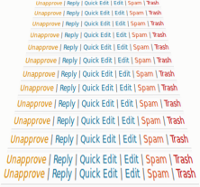 Do you still see links “unapprove, edit, spam, trash” under the comments there? Thus, you still may moderate comments inspite of you have not “moderate_comments” capability. So, the next question – what is the real power of “moderate_comments” WordPress user capability? Today, January 5th, 2012 netbeans.org team announced, that NetBeans IDE 7.1 released. Congratulations! I use NetBeans as my main integrated development environment to work with PHP. So, I downloaded it just got the notification email from netbeans.org. What is first impression? First impression is right the most of the time. On my Ubuntu 10.04 LTS installation was smooth and fast. After 1st start NetBeans as usual asked permission to import settings from the previous installation. Finally, it started and worked as it should. The main part – debugging with FireFox browser still works. So I can continue my Web development work under this version. Small negative – I don’t know where the reason, but I caught the situation, when NetBeans editor window lost cursor focus.